Samphan is a Chinese Water Colour Painter. Born in Bangkok in 1932, Samphan's earliest inspiration toward painting was brush calligraphy taught by her Chinese father. From her first lesson with the Vancouver-based poet and painter Lloyd Yee in 1971, she has trained privately with masters and teachers in Malaysia, the United Kingdom, the United States and China. She has also studied 17th Century gold leaf technique in Kyoto, Japan. Samphan's work is unique in that it combines the pure strokes and discipline of Chinese brush with her own interpretations from nature based on pencil drawing. An avid and accomplished gardener, Samphan uses plants and flowers - nasturtiums, poppies, lilies, columbines, morning glories, wysteria, magnolias, grapes - that she has nurtured in her magnificent garden as subjects in her paintings. She also paints trees and mountain landscapes, reflecting her many travels in Western Canada and Asia, as well as insects and birds. In 2005, she began the study of acrylic portraiture. 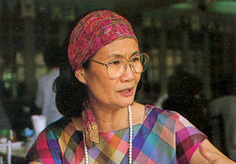 Samphan and her husband, the economist Dan Usher, moved to Kingston in 1967. Over the years, Samphan has shared her knowledge with more than one generation of students in the Kingston area. She continues to paint, teach, and travel and to care for her growing family. She has two children, a daughter-in-law, a son-in-law and six grandchildren in Canada and Norway.